So you’ve bought a dual-core tablet and you think you have the latest of cutting-edge silicon on your slate? 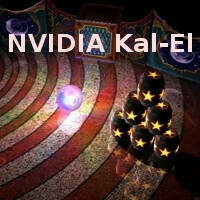 You certainly do, but if you’re the type of geek caring about state-of-the-art hardware, you’d already be thinking about the mind-blowing graphics coming with NVIDIA’s upcoming quad-core chip Kal-El after watching the video demo below. It showcases graphics from the future with dynamic lighting, plenty of realistic physics and buttery smooth gaming, only possible on mobile devices due to the united efforts of four separate processing cores. While gaming will be one of the main beneficiaries of the 12 GPU cores in NVIDIA's upcoming chip, the speed boost will be noticeable all around as the NVIDIA Kal-El outscored the Core 2 Duo in terms of processing power. The Glowball game below runs on a Honeycomb tablet with a resolution of 1280 x 800 pixels. But it’s not just the pretty picture that is rendered - you can adjust the light source and even change it which instantly reflects on the surroundings. All of the objects around you respond naturally, so even the slightest touch of the glowing ball to the drapes causes a realistically beautiful reaction. Just as you would expect, game controls are fully accelerometer-optimized. - Five times faster performance than Tegra 2. The system-on-a-chip was first leaked in February, but its promised release this fall seemed hard to believe. NVIDIA’s aggressive timing however gets the company results as most of today’s dual-core smartphones run on its Tegra 2 chip. If it pushes the chips so first quad-core tablets arrive this August and smartphones around Christmas, the path to success of the new SoC by NVIDIA seems paved. Oh, and that Hollywood Amazon tablet in the works might just be the first one to ride the quad-core waves. wow that is actually pretty freakking cool. Very interesting.. Maybe i’d just save my extra pocket till late this yaer for a quadcore. Besides in my opinion after raeding couples of articles regarding tegra 2, thi nvidia 1st gen tegra chip was designed for mobile phone, its rendering and hardware capabilities was designed for mobile phone. No wonder why most tablets running tegra 2 still tend to lag and suffer some slowdown and battery issues as compared to ipad2. Hopefully, tegra 3 will be a good promise toward its claim. And a new higher versin of android platform MUST be developed for this powerful chip for users to really be able to enjoy every bit of power‘kal-el’ will unleash. A perfect marriage of an android os and a cpu to finally be able to go toe to toe wiht apple’s ipad. I really wish they'd change the name for Russian market, because "Kal-El" literally means "ate feces" in Russian.